Multiple myeloma is a blood cancer that starts in the plasma cells in the bone marrow. Bone marrow is the soft, spongy tissue found inside most bones. It helps make blood cells. 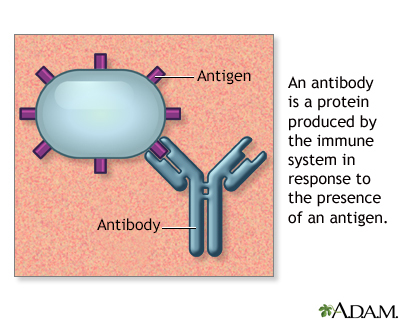 Plasma cells help your body fight infection by producing proteins called antibodies. 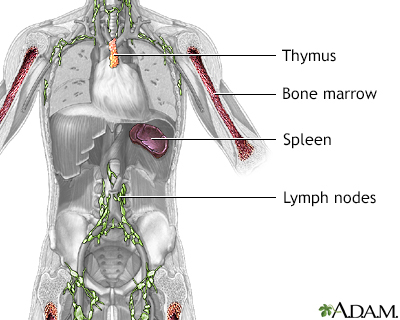 With multiple myeloma, plasma cells grow out of control in the bone marrow and form tumors in the areas of solid bone. The growth of these bone tumors weakens the solid bones. It also makes it harder for the bone marrow to make healthy blood cells and platelets. The cause of multiple myeloma is unknown. Past treatment with radiation therapy increases the risk for this type of cancer. Multiple myeloma mainly affects older adults. As the cancer cells grow in the bone marrow, you may have bone pain, most often in the ribs or back. You may develop broken bones (bone fractures) just from doing normal activities. If cancer grows in the spine bones, it can press on the nerves. This can lead to numbness or weakness of the arms or legs. Bone x-rays may show fractures or hollowed out areas of bone. If your provider suspects this type of cancer, a bone marrow biopsy will be performed. Bone density testing may show bone loss. If tests show that you have multiple myeloma, more tests will be done to see how far the cancer has spread. This is called staging. Staging helps guide treatment and follow-up. People who have mild disease or in whom the diagnosis is not certain are usually closely monitored. Some people have a form of multiple myeloma that grows slowly (smoldering myeloma), which takes years to cause symptoms. Various types of medicines are used to treat multiple myeloma. They are most often given to prevent complications such as bone fractures and kidney damage. Radiation therapy may be used to relieve bone pain or to shrink a tumor that is pushing on the spinal cord. An autologous bone marrow or stem cell transplantation is performed using a person's own stem cells. An allogeneic transplant uses someone else's stem cells. This treatment has serious risks, but may offer the chance of a cure. Outlook depends on the person's age and the stage of disease. In some cases, the disease progresses very rapidly. In other cases, it takes years for symptoms to appear. In general, multiple myeloma is treatable, but only in rare cases can it be cured. Call your provider if you have multiple myeloma and you develop an infection, or numbness, loss of movement, or loss of sensation. Cryoglobulinemia is caused by an abnormal protein that is occasionally found in the blood of people with multiple myeloma, leukemia, and certain forms of pneumonia. It causes blood to gel at low temperatures. 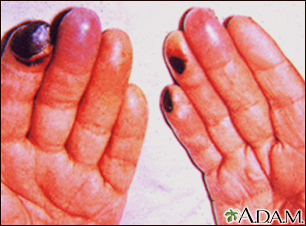 In this picture, cryoglobulinemia has reduced blood flow in the fingers so much the fingers have turned dark. The black areas are gangrene resulting from lack of blood flow.